A week later, malnourished, he is listed “For Sale,” though that posting quickly vanishes. Just five days after that, he is rescued from a dealer’s pen – by now, emaciated. Nine days later, ataxic, unable to walk – euthanized. Horseracing did this, all of it. 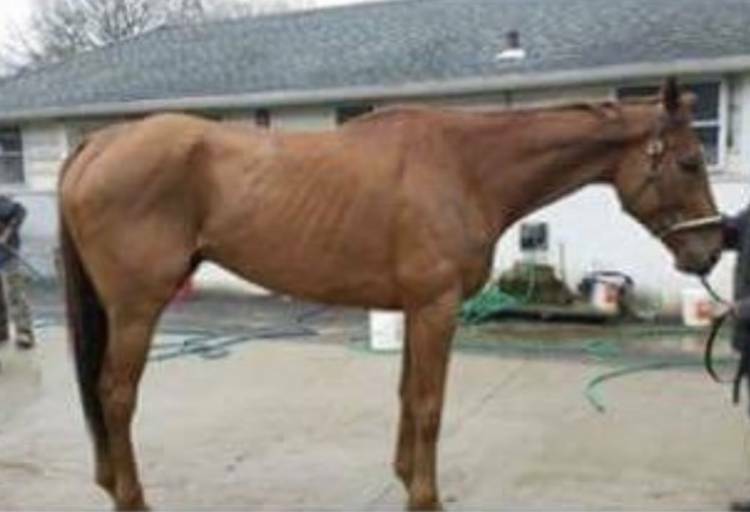 “Anyone looking for a horse?” was the April 28 Facebook post’s opening line. But who could read on when distracted by that photo – a tall chestnut, very thin with a dull, poor coat. And his eyes. Defeated. Resigned. 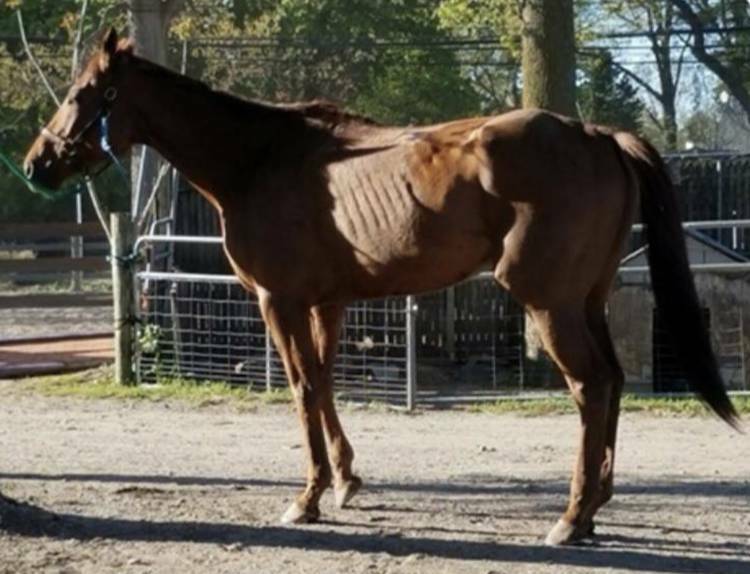 The post continued: “5 year old thoroughbred…ran last wed and was beat by 45 lengths…JC name is Redneck Margartia [sic]…terrible feet…small bump on his RF lat susp branch…owner wants $500…located at Belmont track.” With that photo and write-up, finding a “good home” didn’t look very promising. I shared the post, but within a few hours it was gone. Deleted. So I sent a private message asking if Red was still for sale. The poster: “I deleted the post because…someone said they talked to the owner…he had found a home and been shipped already.” SHIPPED? She added she was only posting for a friend and knew nothing more but was hoping to have additional info in the next day or two. She never did. “Rehomed” within just days of his crushing defeat, with a possible injury and in obvious need of food? “SHIPPED already”? To those familiar with that ominous industry word, it was clear that Red’s life was in jeopardy. Recognizing the poster didn’t sense the possible danger – or simply didn’t care – I decided to call Red’s owner/trainer for that final race, Naipaul Chatterpaul. On April 30, Chatterpaul confirmed Red was already “gone” and had been for “several days” – “he went to a good friend of mine who runs a kids’ camp on Long Island.” I then asked if this good friend – “Wayne” (but whose last name he didn’t know) – might be willing to sell Red to me; I acted surprised when he said he might. Chatterpaul: “Wayne retrains and resells horses.” I asked for Wayne’s number but Chatterpaul said he would call himself. Two hours later, he texted, “he still have the horse” (and WHY wouldn’t he?…he can RETRAIN and sell a fresh-off-the-track TB in just DAYS?…or was there a chance he WOULDN’T still have Red because Wayne is a dealer?). Fellow equine-advocate Lynn Hadfield confirmed my fears about Chatterpaul’s “good friend” Wayne…Wayne Dougal – the go-to guy on Long Island for “lesson barns,” to swap out horses with, or if an owner just needed one sold at auction. Dougal would let me buy Red for $1500, not a penny less. He had, he said, “put money into that horse.” Fund-raising began in earnest, and we quickly reached the necessary funds. Kelly Smith of Omega Horse Rescue agreed to take Red. I felt better knowing he would soon be receiving desperately-needed veterinary care and that, when recovered, every effort would be made to finding Red a loving, forever home. Over the course of several conversations, Dougal changed his stories many times. He had gotten Red a week ago, he said, and had had his teeth floated and had given him ulcer medications (that he couldn’t remember the name of) “for a few days.” Another time, Red had been with him just three days. And when discussing payment and transportation – when Dougal told me to “hold off because the horse is sick; he has got water running out of his nose and the last horse I had that did that, it died” – he claimed the gelding had arrived at his place just that day. Kelly, Lynn and I agreed we couldn’t wait on a professional transporter. The next day, May 3, Kelly made the trip to Long Island and called me as soon as Red was on her trailer. “He’s in rough shape,” she said. “He struggled to load, like he didn’t know where his feet were.” The video she made of him, in his spacious, well-bedded stall upon arrival to her farm, was heartbreaking – Red stood splayed out, his entire body trembling, with copious amounts of water running from his nostrils while he downed two buckets of water. The next morning Red was taken to New Bolton Center. A bad tie-back surgery was just one obstacle he faced. A 2 on the Henneke scale (1=the poorest/thinnest, 9=obese), Red’s issues were complex and puzzling. A decision was made to let him “de-stress” at the farm where Kelly boards some of her rescues who may require follow-up visits to the clinic. Red shared pasture time with another quiet gelding and was across the aisle from this same horse when in his stall. Eating, drinking, resting, sharing days with one of his kind – in the hope that he would gain weight, build strength and “come down” from whatever he had endured. After some good nutrition and time just to be a horse, another and more complete evaluation would be performed and a diagnosis hopefully reached. On May 11, a week later, I was able to make a trip to see Red. All the while, I had been communicating with Chatterpaul. Once he realized I was now aware of Red’s condition, he mentioned a couple of things. For one, Chatterpaul KNEW Red had neurological symptoms: “Oh yea, he had EPM” (equine protozoal myeloencephalitis). These are the last texts I received from Chatterpaul; two more I’ve sent have gone unanswered. After a 19-month disappearance from racing, Redneck Margarita resurfaced at Aqueduct on April 21. Dead-last, 45 lengths back. A week later, malnourished, he is listed “For Sale,” though that posting quickly vanishes. Just five days after that, he is rescued from a dealer’s pen – by now, emaciated. Nine days later, ataxic, unable to walk – euthanized. Horseracing did this, all of it. Sad – and very, very angry.